Thermal transfer printing is widely used by organizations across the world to print barcodes, serial numbers, prices, tracking information and much more on thermal transfer printable labels. In most cases, this printing method ensures that labels last and remain legible throughout the production, shipping process or applicable product life. Though some manufacturers choose to use direct thermal printers, thermal transfer label printers create far more durable and reliable labels, making them the ideal choice for companies searching for a long-lasting solution. Here is an example of a high-quality thermal transfer label ribbon printer. Unlike direct thermal printing methods, thermal transfer printers use heat-sensitive ink ribbon instead of heat-sensitive paper. While the ribbon does add cost, thermal transfer printing offers unmatched durability, quality, a wide selection of material design options that can be printed in colors other than traditional black. According to TechTarget, the three typical thermal transfer ribbon layers include the base label material (such as paper, polypropylene, polyester or polyimide), the heat-sensitive ink ribbon and the coating on printable side of the label. 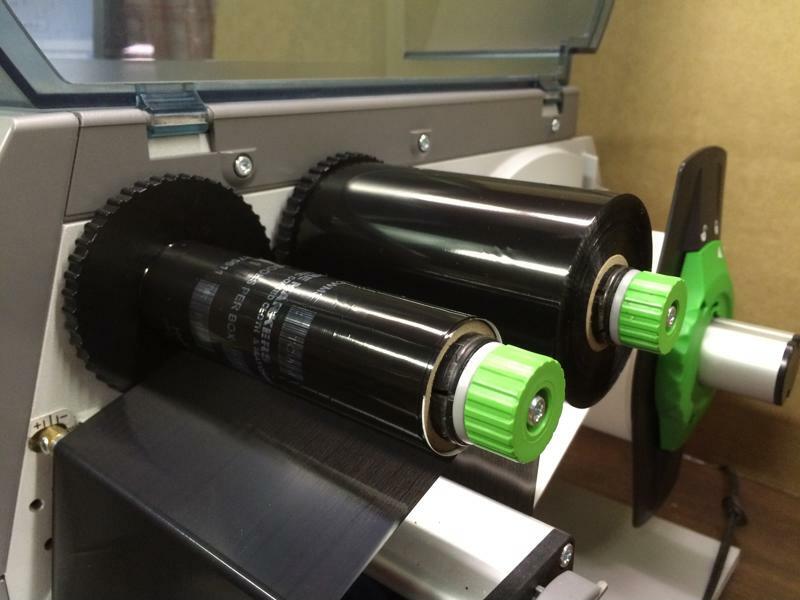 Depending on the printer, companies can use monochrome or multi-colored thermal transfer ribbons to print the highest quality labels for their products, equipment and goods. To keep a printer running smoothly, most suppliers recommend that companies clean off the printhead after each ribbon change. During the printing process, the labeling software drives the printer, while the printhead heats the ribbon to transfer the ink to the label. Thermal transfer printer labels are typically the label of choice for many manufacturers as there are a seemingly endless number of materials, coats, adhesives, sizes and laminates to choose from. While most of these labels are durable enough to withstand certain levels of heat and moisture exposure, companies can choose from polyimide or polyester labels that tend to be the most rugged when exposed to harsh chemicals, extreme heat and various contaminants. "Thermal transfer printers use heat-sensitive ink ribbon." These labels are best suited for permanent labeling, PCB manufacturing, inventory identification, telecommunication labels, rating plates, certification labels, freezer storage labeling, outdoor applications, asset tracking and various other forms of product identification. However, any industry that wants to apply labels that withstand the test of time and use should turn to thermal transfer printing to meet all their labeling needs. What type of thermal transfer printer would best suit a company's operational needs? When deciding what brand, type and style of thermal transfer printer to use, companies must carefully consider all the factors of their labeling application. For example, manufacturers intending to print more than 400 to 500 labels a day should consider investing in an industrial-strength thermal transfer printer, while smaller operations may not require as robust of a printer. Meanwhile, a high-resolution printer will be able to reproduce most barcodes or serial labels in a small area with the required degree of clarity. This specific feature is ideal for printed circuit board manufacturers that deal with small parts and available labeling areas. Overall, when considering what type of printer would best meet a company's labeling requirements, consider the label's potential environment, desire for color, cost and required life span. At Stranco, our high-performance thermal transfer labels are fully compatible with a wide range of top-selling thermal transfer printers brands, including Sato, Zebra, Brady, Intermex and Datamax. No matter what your labeling requirements, our helpful customer service professionals will work with your team to design the right label to meet your precise labeling applications and printer needs. Contact us today to learn more about our affordable rates, fast shipments, extensive inventory of thermal transfer dies and low minimum orders.